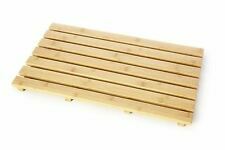 This wooden bamboo duckboard is great for wet room, showers, bath tubs. It provides an anti slip surface to land on after having a shower or bath. It is very easy to clean and is designed to dry very quick. BATHROOM DUCK BOARD - This bathroom duck board is perfect for when you have a bath or shower as it allows you to safely exit the shower or bath without slipping on the floor. This bathroom duck board is perfect for when you have a bath or shower as it allows you to safely exit the shower or bath without slipping on the floor. Fixings supplied. Standard Toilet Seat White. Durable polypropylene seat with standard close hinges. Easy to clean and can be recycled. Maritim decorated with striped wooden fish, starfish, and fish net. Anchor length 18cm, total length with cord 25cm. Anchors with hook. Decorative anchors with hook. Decorative anchors with hook for towel or clothes. Grey POP-UP LAUNDRY HAMPER. COLOUR: Grey. Quick and easy to install. Wipe clean with a Damp Cloth. Product Includes: Fittings & Fixtures. Size: 455 x 365 x 50 mm approx. Color: The color will sent by random. Absorption: 15s-20s. Fairtrade Wooden Shabby Chic Lighthouse Toilet Roll/Kitchen Roll Holder. These are a Fairtrade product. Would suit kitchen roll or two toilet rolls. Red, yellow, orange, mint, blue and cream. Black Diamante Toilet Seat. Keep your bathroom organized with an extensive range of bathroom accessories by Sabichi. Diamante Toilet Seat - Black Color. Anti Bacterial Moulded Wood. Your item must be unused. Suitable for Most WC Basins. 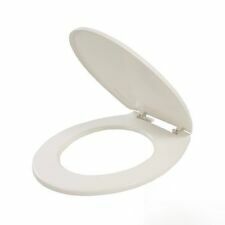 New Striped White Heavy Duty 18" MDF Toilet Seat With Solid Zinc Fittings & Hinges. MDF White Toilet Seat. With Clean & Easy Wipe Smooth Surface. Heavy Duty - Not flimsy, Robust Design. • Adjustable hinges to toilet bowl for all spacing 11,0 - 20,5 cm. • Toilet seat made from high-quality wood. • Suitable for all standard toilet bowls. TOILET SEAT GREY. TOILET SEAT GLITTER SILVER. 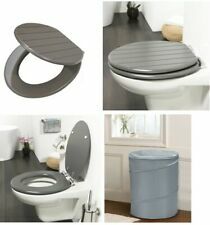 TOILET SEAT SEA STAR GREY. Natural material. IN ALL CASES, YOUR STATUTORY RIGHTS ARE NOT AFFECTED. Winning an item constitutes your acceptance of this. Sound & Vision. Clothes, Shoes & Accessories. Pet Supplies. Rectangular shape. Moulded Wood Diamante Toilet Seat. Embedded into a gorgeous moulded wood, the toilet seats. Description: Modern, simple style works for any decor in any room. Made from sustainable wood. Environmentally friendly product Without the use of harmful chemicals. THERMOSTATIC MIXER. COLUMN FINISH COLOR: WHITE STRIPED WOOD EFFECT. MODEL: VANITY S. MULTIFUNCTIONAL BATHROOM COLUMN WITH SHOWER HEAD (WITHOUT WHIRLPOOL). FITTED COLUMN MULTIFUNCTIONAL BATHROOM Hand shower with hose. COLUMN FINISH COLOR: WHITE STRIPED WOOD EFFECT. MULTIFUNCTIONAL BATHROOM COLUMN WITH SHOWER HEAD (WITHOUT WHIRLPOOL). MODEL: VANITY S. Hand shower with hose. 1 and 2 = Tap connections. Rainfall Shower. THERMOSTATIC MIXER. COLUMN FINISH COLOR: WHITE STRIPED WOOD EFFECT. MODEL: VANITY. MULTIFUNCTION WHIRLPOOL EQUIPPED BATHROOM COLUMN. FITTED COLUMN MULTIFUNCTIONAL BATHROOM Hand shower with hose. Vertical hydromassage and Spine. COLUMN FINISH COLOR: WHITE STRIPED WOOD EFFECT. MODEL: VANITY S. MULTIFUNCTIONAL EQUIPPED BATHROOM COLUMN WITH SHOWER HEAD. FITTED COLUMN MULTIFUNCTIONAL BATHROOM Hand shower with hose. Vertical hydromassage and Spine. A wobbly, chipped or stained toilet seat is an uncomfortable eyesore that you don't want your guests to find in the bathroom! With the Harbour Housewares White Wooden Adjustable Toilet Seat, you can easily replace a worn out toilet seat and instantly improve the look of your bathroom. Wirquin Trendy Line Funky 20717964 Toilet Seat. Suitable for: Standard toilet bowls. Features and pros: - Tested with 20000 open/close actions; - Material: pressed wood; - Hinges: stainless steel; - Weight: 3,4kg. 5 out of 5 stars - Wirquin Trendy Line Funky 20717964 Toilet Seat. 3 product ratings3 product ratings - Wirquin Trendy Line Funky 20717964 Toilet Seat. Adjustable hinges to toilet bowl for all spacing 105 - 205mm. - Toilet seat made from high-quality wood. - Suitable for all standard toilet bowls. Beautiful designer toilet seat. Toilet seat made from high-quality wood. Suitable for: Standard toilet bowls. Trio Acacia Wood Bath Shower Mat. 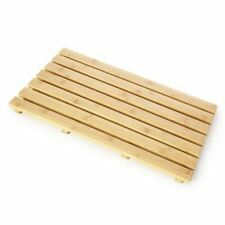 The high-quality wooden bath mat is particularly suited for the bathroom or sauna area. Material: Acacia hardwood (varnished). The mat is made of high-quality acacia wood, a tropical hardwood, which of course is weather-resistant and highly durable. Color: The color will sent by random. Material:Non woven fabric. Absorption: 15s-20s. 3 pcs Acacia Bath Mat 80 x 50 cm. The mat is made of high-quality acacia wood, a tropical hardwood, which of course is weather-resistant and highly durable. The mat is equipped with rubber backing to prevent slipping.